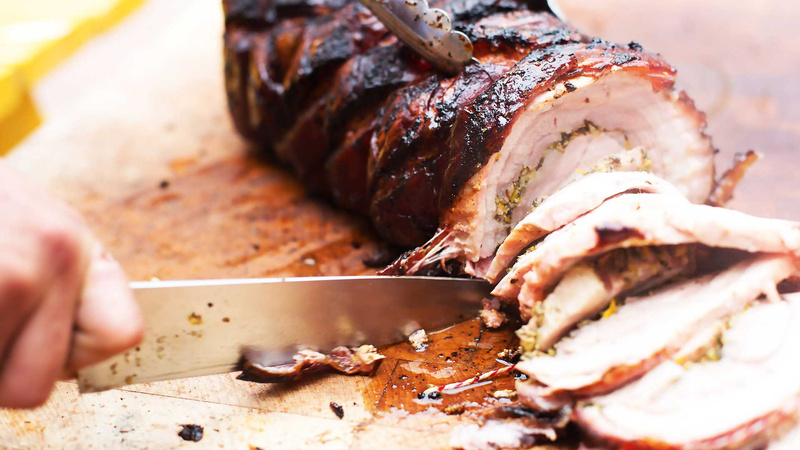 You can cook your porchetta slowly at a low temperature, roast it hot and fast or go somewhere in the middle. Cook it how you like, just don't burn it. Catch Jon Finch and Ben Merrington cooking up their porchetta on the Live Fire Demo stage at Black Deer Festival on 22-24 June. Open up the pork belly and lay it flat on a worktop, skin side up. Using a Stanley knife, score the entire skin in a 2cm criss-cross pattern. The blade should be deep enough to cut through the skin and fat, but not into the meat underneath. Set the fine salt to one side and mix the rest of the ingredients together in a bowl. Turn the belly over, meat side up, and massage the herby mix all over. Lay the pork loin along the belly and then roll all up together, securing tightly with butchers string every inch or so. Massage the skin all over with the fine salt. Set your BBQ with two zones. Sear over direct heat for 30 mins then transfer to the indirect side with the lid down to cook through until the internal temp reaches 75°C and the outside skin has crisped up to delicious crackling. Alternatively you can roast in a medium hot oven around 170°C for three to four hours. Before serving allow the porchetta to rest uncovered for 10-15 mins then slice thinly.